July 23 - Saint Birgitta (Bridget), Religious - Optional Memorial - My Catholic Life! Upon entering the baroque Basilica of Saint John Lateran in Rome, on the first pillar to the right, is a fragment of a medieval fresco by the master Giotto. It is incongruous with the style of the rest of the often restored Basilica. The fresco has been preserved, partial but unchanged, because of its historical importance. It depicts Pope Boniface VIII proclaiming the first Jubilee Year in 1300. That Jubilee, and its indulgences, brought so many pilgrims to Rome that the original intention to celebrate a Jubilee every one hundred years was reduced to every fifty years. 1350, then, saw the second great Jubilee. Ironically, the Pope was living in Avignon at the time. For political reasons, he was unable to visit the eternal city during the very Jubilee he had called. Among the throngs of pilgrims who did swamp Rome in 1350, however, was today’s saint. Saint Bridget made the grueling journey from far away Sweden. Unlike a typical pilgrim, however, she did not return home after earning her indulgence. Rome became her new home and the platform that made her, and her writings, famous. Bridget only returned to her birthplace twenty-three years later, when her daughter, also a canonized saint, carried her mother’s remains triumphantly back to Sweden. They rest today in a secular museum which, before the Reformation, had been the first monastery Bridget founded. The details of the first half of the life of Saint Bridget of Sweden evoke a place long lost to history—Catholic Scandinavia. For hundreds of years, the true faith thrived in these lands, and incubated great saints such as Bridget. She was married at the age of thirteen and lived happily with her husband for twenty-eight years, bearing eight children. They were a pious couple, even completing the famous pilgrimage to the shrine of Santiago de Compostela in Spain. But her husband died while Bridget was only halfway through her life’s journey. Bridget then spent three years in mourning in a Cistercian monastery. During this period, the spiritual visions she had experienced throughout her life increased in number and vivacity. After a particularly powerful vision in 1346, she founded the monastery that would eventually be her burial place. But it wasn’t built to house an existing order. Responding to the words of Jesus, Bridget wanted to reform monastic life by founding a new congregation, the Order of the Most Holy Savior, or the Bridgettines. The Rule for the new order was revealed to her throughout numerous and detailed visions. It was built on the rule of Saint Benedict and was approved by the Pope only near the end of her life. The Bridgettine Order spread throughout Europe, and is found in numerous countries today, due largely to its founder’s incredible spiritual visions. 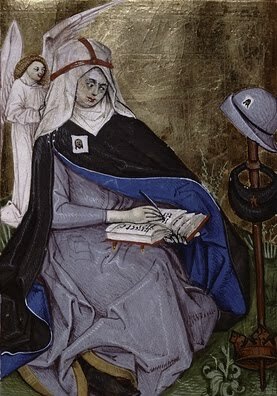 Saint Bridget, like Saint Catherine of Siena, labored to convince the popes to return to Rome from Avignon. She even invoked the Lord’s opinions about the papal exile as culled from her visions. One letter she wrote to the pope was so strongly worded that her envoy refused to read it when he was in the Holy Father’s presence. An Italian woman Bridget had become friends with during the Jubilee of 1350 donated to her a large palace in central Rome. Saint Bridget and her sisters established their Roman foundation there and it is where Saint Bridget died. A Bridgettine convent occupies the same building today, and preserves the founder’s rooms and a relic of her and her saintly daughter. Saint Bridget was canonized eighteen years after her death, in 1391, due to her Christian virtue, her deep and sincere piety, her life of strict poverty and assistance to the poor, her devotion to the Virgin Mary, and her many pilgrimages to the shrines of the saints. She was a saint who loved saints. But she became famous for other reasons—mainly because of her intense, highly detailed, and provocative spiritual revelations. The revelations were written down in both Swedish and Latin, translated into multiple languages, and then diffused throughout Europe. Christ’s arresting words on death and judgment, heaven and hell, and right and wrong sparked the imaginations of all who read Saint Bridget’s writings. Saint Pope John Paul II named Saint Bridget a co-patroness of Europe in 1999. Saint Bridget, may your example of poverty, devotion, and prayer be an example to all who seek to live a life in Christ, and may your writings fire our imaginations to burn ever hotter and brighter with love of God. ST. BRIDGET was born of the Swedish royal family, in 1304. In obedience to her father, she was married to Prince Ulpho of Sweden, and became the mother of eight children, one of whom, Catherine, is honored as a Saint. After some years she and her husband separated by mutual consent. He entered the Cistercian Order, and Bridget founded the Order of St. Saviour, in the Abbey of Wastein, in Sweden. In 1344 she became a widow, and thenceforth received a series of the most sublime revelations, all of which she scrupulously submitted to the judgment of her confessor. By the command of Our Lord, Bridget went on a pilgrimage to the Holy Land, and amidst the very scenes of the Passion was further instructed in the sacred mysteries. She died in 1373.